To do a full system virtualization, a lot of memory and disk space is needed just as we need to run an operating system in our computer. Docker is a containerization system. A Docker virtual machine is called a container. How that works is, Docker uses the kernel of the host operating system and uses the Linux kernel’s namespacing features to isolate the containers. So a Docker container do not need a kernel installed and many other dependencies. That makes them lighter and faster. The only downside is that, a Docker container can’t have a different kernel than it’s host operating system. If you want to run a different kernel than the host operating system, you must use full virtualization, not containerization. In this article, I will show you how to install and use Docker on Ubuntu 18.04 LTS. In this section, I will show you how to add Docker package repository on Ubuntu 18.04 LTS. The required packages should be installed. The official Docker package repository should be added and the APT package repository cache should be updated as well. All the required packages should be downloaded and installed. As you can see, the Docker service is running. Now should add Docker service to the system startup so that it will start automatically on system boot. By default, you must run Docker as root user. You can also run Docker with sudo if it is configured on your Ubuntu 18.04 LTS machine. If you don’t want to use Docker as root user or with sudo, then you should add your login user to the docker group. Now you should be able to run Docker without sudo or root user. Docker image repository has images for almost anything you need. For example, if you want a php server, you can install a php server image and you will be ready to run php scripts. As you can see, all the Docker images for Node.js is displayed. To install a Docker image, you just have to type in the image name is the NAME column as marked in the screenshot below. Now let’s say, you want to download the mhart/alpine-node image of Docker. Downloading a Docker image is called pulling a Docker image in the Docker term. The Docker image should be pulled. As you can see, the Node.js image I pulled is listed. 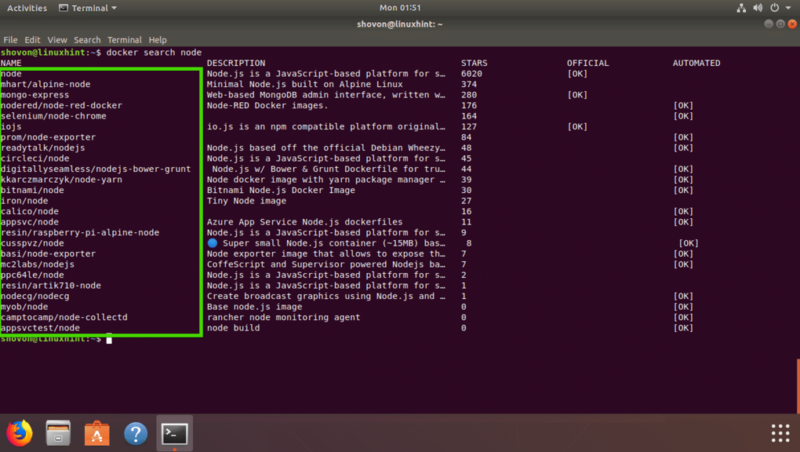 In this section, I will show you how to run a Node.js script index.js with the Docker Node.js image mhart/alpine-node that I just pulled from the official Docker image repository. Now type in the following line and save the file. As you can see, the index.js Node.js script ran successfully and the correct output was printed. Now let’s explain what’s happening here. 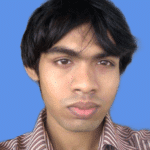 –name hello_node – Set’s hello_node as the name of the running container. –rm flag removes any other running container with the same name as this container. -v “$PWD”:/usr/src/app/hello – Mounts the current working directory of your Ubuntu 18.04 LTS machine to the /usr/src/app/hello directory of the Docker container. -w /usr/src/app/hello – Navigate to the /usr/src/app/hello directory in the Docker container. mhart/alpine-node – Name of the Docker image that this container will be based on. node index.js – It is the command that will be run inside the container. So that’s how you install and use Docker on Ubuntu 18.04 LTS. Thanks for reading this article.